A new life in your family- wow what an amazing blessing. I am filled with awe, wonder and love whenever I hold a newborn baby. It is the most natural instinct in us to want to give thanks for this gift of a new life and to ask for a blessing on our child. I would love to be able to create for you and your family a naming and blessing ceremony for this special child which will express your gratitude and heartfelt wishes for them as they grow. 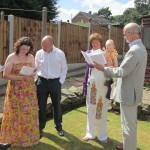 I work closely with you so between us, we create the words and ceremony that feel right for your family. 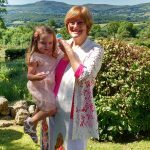 As a parent, bringing up our children is one of the most fulfilling and also one of the most challenging things we are called on to do in life, so to know that you have a network of loving support can be very helpful. 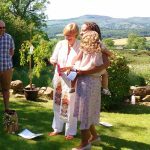 I am always happy to involve the wider family such as grandparents or special friends in the ceremony. 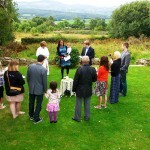 I also ensure the ceremony is as child friendly as possible if there are to be young children present. 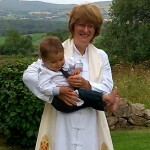 With joy in our hearts we welcome you ….. into our world and into this family. We honour your beauty and make way for your gifts. The choice o f venue is yours. It can be in your own home or garden, or in hired premises. 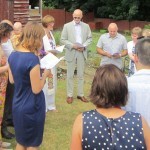 I have found it to be particularly special when the ceremony is held outdoors. 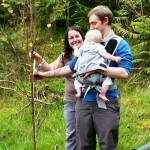 On two occasions this year the family have chosen to include a tree planting as part of the blessing ceremony. 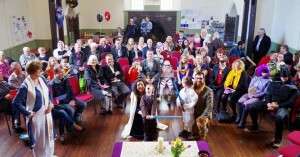 Two brothers keen on Star Wars had a baptism ceremony bringing in the idea of them being a ‘force for good in the world’ – complete with light sabres! I believe it is important that the ceremony has meaning for the individuals involved and this meant something to the boys! 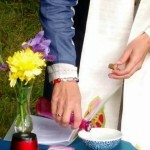 After the ceremony you receive a certificate of naming, along with any other memento created as part of the ceremony. Families have chosen to have their guests write their wishes for their child in a special book, on an embroidered tablecloth and as fingerprints creating the leaves of a tree on an original painting. You can be as imaginative as you wish in creating a lasting record for your child.